The ASUS M580VD-EB76 is a 2017 VivoBook 15.6″ model with i7 CPU that will surprise you in terms of price, and in a lot of ways. Sold as ASUS M580VD-EB76 VivoBook 15.6″ FHD thin and light Gaming Laptop (Intel Core i7-7700HQ, GTX 1050 4GB, 16GB DDR4, 256GB SSD+1TB HDD), backlit keyboard, aluminum chassis. Some of amazement with this VivoBook will have to do with the fact that it has the latest generation of i7 Intel processor. Your previous laptops will feel outdated next to this VivoBook. So let’s start with the review. ASUS M580VD-EB76 weight is about 5.1 lbs, a really light device. 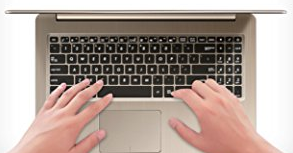 All the ASUS VivoBook M580VD models have durable and aluminum chassis or body. 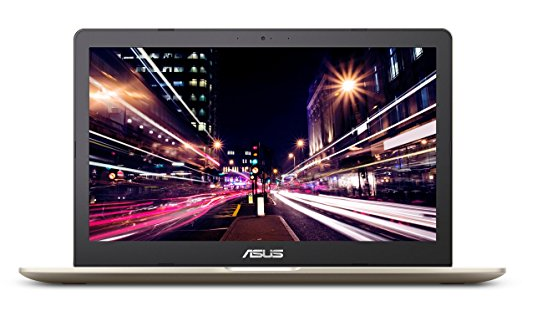 This specific ASUS M580VD-EB76 model is 0.8″ thin and has a Metallic Champagne color. If you tote your laptop around, you will be amazed by the lightness of this laptop. The i7 version ASUS M580VD-EB76 has a quad-core 2.8GHz i7-7700HQ CPU, and 16GB of RAM. The combination with 1TB HDD, and a 256 GB M.2 SATA3 SSD is an advantage. Which makes the laptop turns on fast, really fast. It does not have Intel’s latest option memory technology. The Windows 10 Home 64-bit OS is booting from the SSD (Solid State Drive). This is the advantage of having a SSD laptop, it boots up real fast. From my experience, if you have a laptop that has a super fast booting time, you would not have to shutting down your device often. Because to turn your device back on again takes probably the same amount of time as waking your device up from the sleep mode. Keep in mind, this would support the SSD SATA 3 only. The i5 version has SSD only, the i7 has SSD and 1TB HDD. The RAM speed on this device is 2400 MHz, and it is a 16GB of DDR4 RAM. The capacity of RAM max capacity is 16GB. This 2017 ASUS VivoBook features a more than adequate amount of power with no noise. In an idle state, you should not hear noise from the fan RPM, it should be low. The more loaded the CPU or GPU the fan’s RPM will work more accordingly. This unit has a 15.6″ with 16:9 screen ratio, LED Backlit FHD resolution (1920×1080) with 60Hz refresh rate. The percentage of sRGB color accuracy of this laptop is 46% NTSC. The screen is a matte screen with anti-glare panel so it won’t strain your eyes if you like to game a lot and long. The screen is not an IPS and has no touchscreen feature. It does not have a fingerprint scanner either. M580VD vs N580VD. N580VD has 4k resolution. ASUS M580VD-EB76 packs a solid NVIDIA GTX1050 4GB GDDR5 GPU which is perfect for gaming, visuals, and supports virtualisation. Check this if you look for older laptop that has NVIDIA graphics card. M580VD-EB76 has 4GB GPU. M580VD-EB54 has 2GB GPU. For the peripherals, this VivoBook 2017 has backlit keyboard, a RJ45 port, Bluetooth v4.2, WiFi, USB 2.0, USB 3.0 Type-A, USB 3.1 Type-C gen 1, HDMI 1.4 port, SD card slot, an HD webcam, 1x Headphone-out, and built-in speakers. USB-C port is a big advantage that you can use to output video directly from your laptop to an HDMI display. The laptop’s charger is compatible with 100~200v power outlets. This unit doesn’t have a removable battery though. It comes with a 47WH battery, the battery should last approximately 6 hours for normal computer use and 3 until 4 hours for heavy use and settings. ASUS M580VD-EB76 VivoBook is a great well-featured Windows 10 gaming portable laptop, including the USB Type-C.